Not Another X Files Podcast – “Welcome to Vancouver, the home of The X Files. 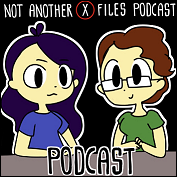 Join us as we take a journey from pilot to finale, complete with improv, shipping, and lots of singing!” – I get into the mood to re-watch The X Files every few years, and this time around I have decided to do it while simultaneously listening to a podcast. This seemed like a good one to start with because one of the hosts has never seen the show before and I thought it would be fun to hear about the show from a new fan’s perspective. I’m already loving it because the girl who has never watched the show before immediately fell in love with Mulder. I RELATE. 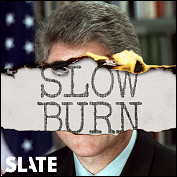 Slow Burn – “Leon Neyfakh excavates the strange subplots and forgotten characters of recent political history – and finds surprising parallels to the present.” – Around the time I decided I wanted a break from listening to true crime, I saw this recommended on a list of top podcasts of 2018 and I decided to check it out. This has been really interesting for me to listen to because as much as I had a general idea about what happened during Bill Clinton’s presidency, I have learned a lot through this podcast about the details of what actually went down. 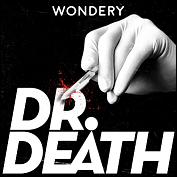 Dr Death – “We’re at our most vulnerable when we go to our doctors. We trust the person at the other end of that scalpel. We trust the hospital. We trust the system. Dr. Christopher Duntsch was a neurosurgeon who radiated confidence. He claimed he was the best in Dallas. If you had back pain and had tried everything else, Dr. Duntsch could give you the spine surgery that would take your pain away. But soon his patients started to experience complications. And all they had to protect them was a system ill-equipped to stop the madness.” – I had seen this podcast recommended by quite a few people on my twitter feed, so it had been sitting on my “to listen” list for a while. If you have any sort of paranoia about surgery or hospitals or anything of that nature I would highly recommend NOT listening to this podcast. If not, go for your life because it’s fascinating and utterly terrifying. 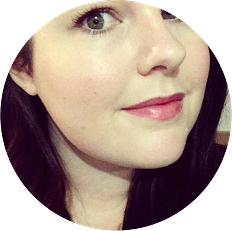 Let’s Talk OC – “Do you love The OC? Do you miss the show? Well you’re in luck! 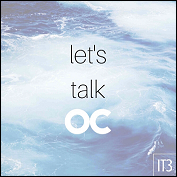 Let’s Talk OC is the podcast for you. Join obsessed fan Michelle, Liss, who has seen the show once and Ingrid the newbie, as they watch and share their thoughts every Monday!” – As soon as I spotted The OC on Stan, I knew I had to do a re-watch. This show is super nostalgic for me and brings back so many memories of late high school and the years that followed. Similarly to first podcast mentioned here, I am watching television episodes and then listening to the corresponding podcast episode, and it’s been a lot of fun so far.